Bush, Martin reveal intent of U.S. immigration policy)"Together, let us go forward to build an age of prosperity in a hemisphere of liberty. Together, let us use this Summit of the Americas to launch the century of the Americas." Tres amigos from left to right: Mexican Presidente Vicente Fox, U.S. President George W. Bush and Canadian Prime Minister Paul Martin have been meeting to discuss erasing borders between the three nations. 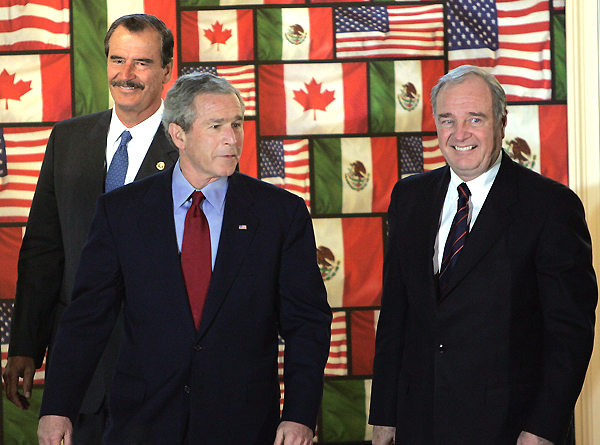 On March, 23, 2005, President Bush, Mexican President Vicente Fox and Canadian Prime Minister Paul Martin met at the Bush’s Crawford ranch and in Waco, Texas, to reaffirm their commitment to a "common security perimeter" encompassing the three nations. The plan is intended to open the borders, facilitating the free flow of trade commodities while lifting the restrictions on immigration that inhibit workers from enjoying gainful employment throughout North America. Called the "Security and Prosperity Partnership of North America," the plan will effectively erase the borders with Canada and Mexico. The agreement is going forward on the fast track and is scheduled to be implemented by 2010. If you look at the CANAMEX article below and incorporate the information found on page 7, it suddenly becomes clear why the U.S. has allowed an estimated 30 million Mexicans to enter the country illegally. It has already been determined that they will be granted amnesty. One would think that the planned and systematic dismantling of our sovereign nation and the erasing of its northern and southern borders would be frontpage news. But it’s not. It is happening without the knowledge or consent of the American people.